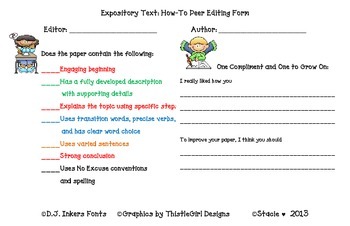 Attached are 12 pages (I usually print 2 to a page) for students to peer edit according to the requirements of the Common Core Standards. 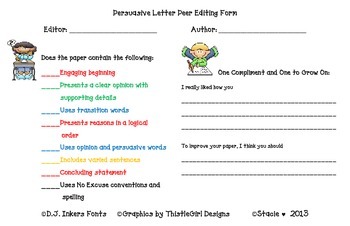 Each peer editing sheet is color coded to help students underline the evidence for each point in their own work prior to the end of the editing process. The editor uses the color coded sheet to help him/her look for evidence and check off that it is there. 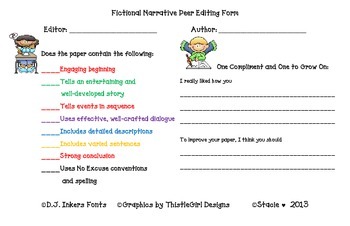 There is also a section for the editor to recommend a change and compliment something the author did well. 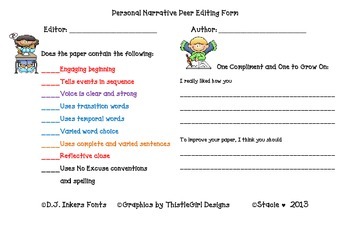 Students love using these as part of their writing process.